Clifton Park, New York - Spring is in full swing and it's the perfect time to get out on the course. The newly acquired Clifton Park Barney Road Golf Course is now open for it's first season. The town of Clifton Park purchased the golf course in October 2010 for $1,075,000. The purchase was a strategic move to permanently protect 39 acres of parkland in Clifton Parks' oldest neighborhood. The course is also projected to bring in $50,000 per year for the town. 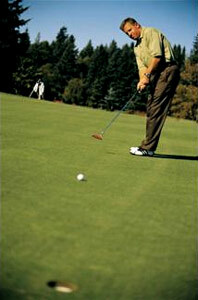 The executive par-3 golf course is just minutes from the Exit 9 area and open daily from 7:30 am to dusk. The 9-hole course is great for both beginners, who are looking to ease into an 18-hole round and experienced golfers, who are looking to work on their short game. The Barney Road Golf Course is located at 1 Barney Road, Clifton Park, NY. For more information call the town of Clifton Park at (518) 371-6667.